When you get your new super fast car delivered, do NOT put the pedal to the floor right out of the driveway. 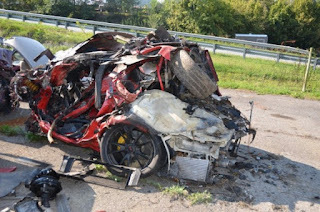 This driver couldn't wait but 4 hours after delivery to put his Porsche GT2 RS into a semi at 160mph. You don't see this happening to professional race car drivers. Please, take it to the track, so you can eat dinner with your family that night. Thoughts and prayers out to the families involved with this terrible accident.